Timothy C. Hain, MD of Chicago Dizziness and Hearing. The normal cochlea has two and one-half turns. A cochlear malformation consists of a membranous abnormality, a bony abnormality, or a combination of these two. If cochlear development is arrested in the embryo, a common cavity may occur instead of the snail like cochlea. A complete labyrinthine and cochlelar aplasia is called the Michel deformity. 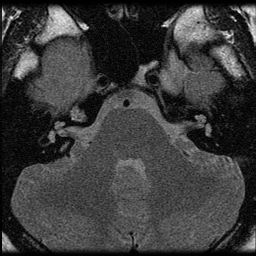 Many cases of bilateral Mondini and related malformations, are genetic in origin (Chen et al, 2012). Unilateral Mondini malformations are not generally inherited. 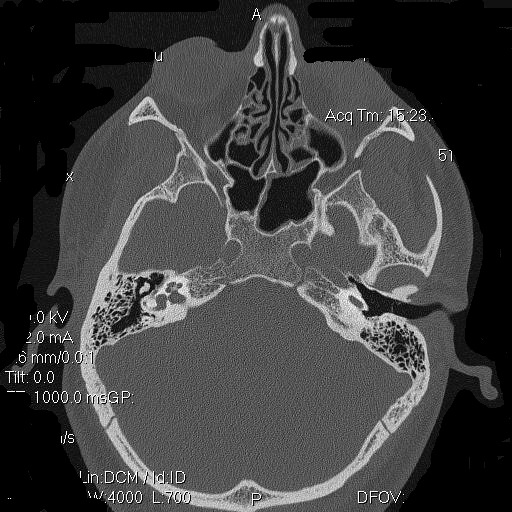 This is a radiological diagnosis, generally made with a high-resolution CT temporal bone CT scan. Note that these scans should not be performed lightly as they entail considerable radiation. Often accompanying the Mondini dysplasia is abnormal communication between the endolymphatic and perilymphatic spaces of the inner ear and subarachnoid space. It is usually caused by a defect in the cribriform area of the lateral end of the internal auditory canal. Presumably because of this abnormal channel, perilymphatic fistulae are more common in this disorder. Nearly all persons with Mondini malformations are completely deaf on the affected side. While the hearing loss in these malformations is probably sensory in origin, the audiograms in these people sometimes suggest a conductive hearing loss -- this is probably related to relatively better bone conduction in some of these malformations than normal because of lower compliance between the perilymphatic and CSF compartments.This is similar to the situation in superior canal dehiscence. Nearly all persons with Mondini also have absent vestibular function on the affected side, but this cannot be relied upon. See below regarding present otolithic responses in the CHARGE variant. Children with these malformations may also exhibit motor delay due to damage to the labyrinthine part of the inner ear (Bodensteiner et al, 2003). A related anomaly and more severe syndrome, the CHARGE association consists of coloboma, heart disease, choanal atresia, retarded development, genital hypoplasia, ear anomalies including hypoplasia of the external ear and hearing loss. These individuals have a Mondini type deformity and absence of semicircular canals. A recent report documents that they have normal otolithic responses to off-vertical axis rotation (Wiener-Vacher et al, 1999). As in the Mondini malformation, the semicircular canals or otoliths may be preserved, there is a possibility of dizziness from a "sick" ear. In the author's experience, this usually occurs in early adulthood. The reason for this is that accompanying the Mondini dysplasia is abnormal communication between the endolymphatic and perilymphatic spaces of the inner ear and subarachnoid space. It is usually caused by a defect in the cribriform area of the lateral end of the internal auditory canal. Presumably because of this abnormal channel, perilymphatic fistulae are more common in this disorder. Surgeons who are planning to operate on persons with a Mondini need to be aware and plan for the possibilty of a "CSF gusher". This means that due to the open communication between the inner ear and spinal fluid compartment, cerebrospinal fluid can "gush" out of an opened inner ear. It would seem to us that fistula "repairs", using conventional soft-tissue seals, are doomed to fail. To us, it would seem that the main options are between sealing the windows with cement, or simply a complete labyrinthectomy. This man with congential deafness developed dizziness as an adult. 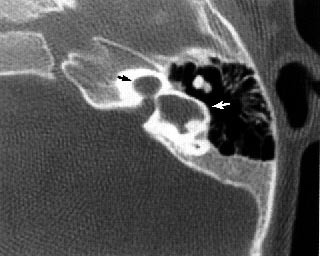 This CT of the temporal bone shows a clearly intact cochlea and semicircular canal system on the left side of the picture (right side of the head), but the cochlear turns cannot be seen on the right side of the picture. Hearing is normal on the right side, and absent on the left. There is a "shadow curve" on the right as very loud sounds on the right cannot be masked. 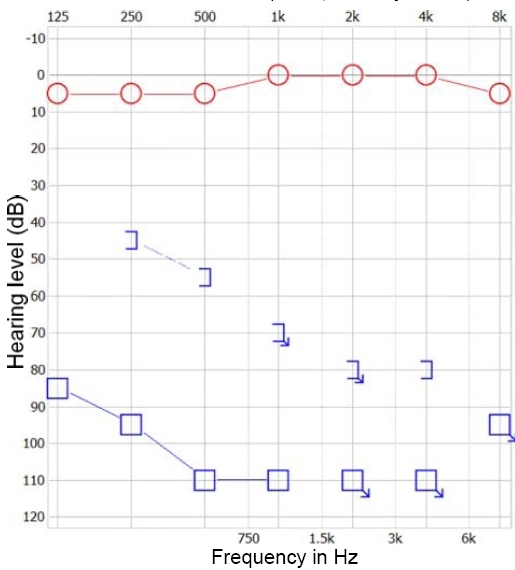 A VEMP test shows a small response on the left side, in spite of the fact that hearing is absent on the left. 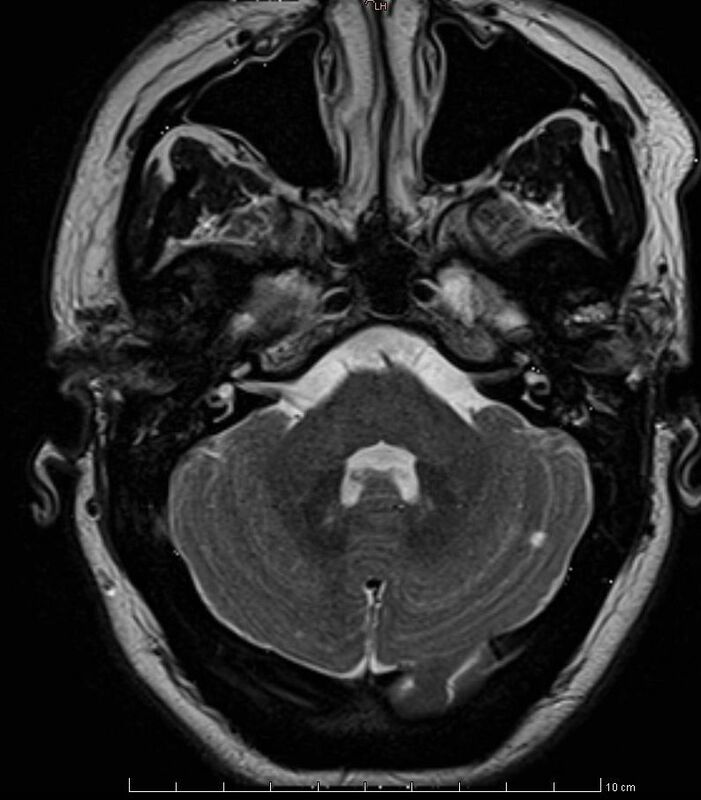 This is likely due to preserved semicircular canals on the left side (which can be seen on other images). Note also that there is a contralateral VEMP response on both sides, and that the contralateral response for left sided stimulation is bigger than the ipsilateral response ! 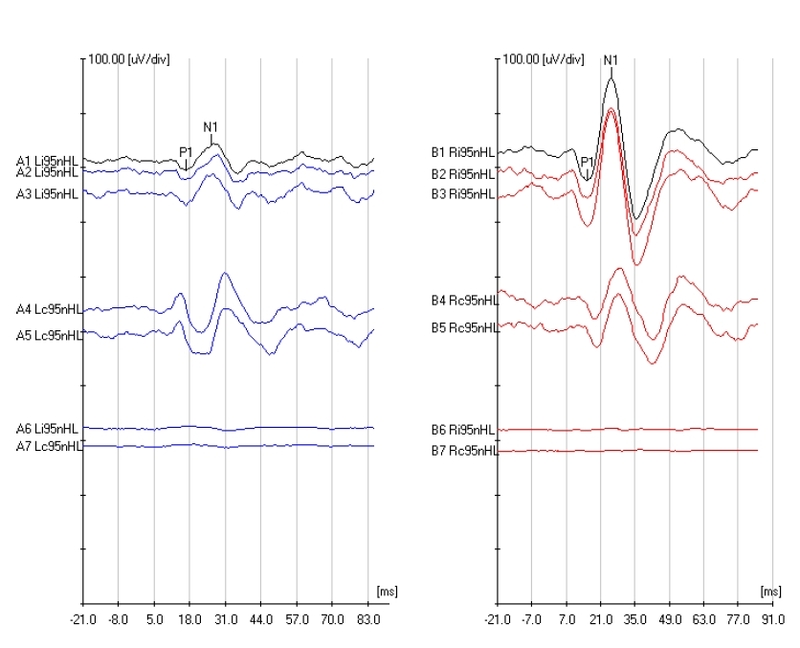 This illustrates the pitfall intrinsic to using bilateral stimulation and bilateral recording for VEMP's - -responses on one side may be due to stimulation of the opposite side. MRI read by radiologist as showing hypoplastic lateral canals. Patient with Downs syndrome. Normal MRI of inner ear for comparison purposes.